In Melissa Balmain’s Walking in on People, the serious is lightened with a generous serving of wit and humor, and the lighthearted is enriched with abundant wisdom. She shows us how poetry can be fun yet grounded in everyday challenges and triumphs, with subjects ranging from the current and hip (Facebook posts, online dating, layoffs, retail therapy, cell-phone apps, trans fat), to the traditional and time-tested (marriage, child-rearing, love, death). Through it all, her craft is masterful, with a formal dexterity deployed with precision in a showcase of forms such as the villanelle, ballad, triolet, nonce, and the sonnet. It is little wonder then that Walking in on People is the winner of the 2013 Able Muse Book Award, as selected by the final judge, X.J. Kennedy. This is a collection that will not only entertain thoroughly, but also enlighten and reward the reader. Walking in on People grabbed me with its very title, and it never let go. Poetry these days is rarely so entertaining, so beautifully crafted, so sharp of eye, yet so wise and warm of heart. Melissa Balmain keenly perceives faults in people and in our popular culture, with piercing wit but never bitterness. Don’t miss the wonderful “Lament,” on what it takes to write a best seller, or “The Marital Bed,” a love poem with naturalistic detail. She really commands her art. Indeed, I think any poet who rhymes lobsters and Jersey mobsters deserves to have an equestrian statue of herself erected in Bangor or Newark or both. Melissa Balmain’s poems add to the rhythmic bounce of light verse a darker, more cutting humor. The result is an infectious, often hilarious blend of the sweet and the lethal, the charming and the acidic. 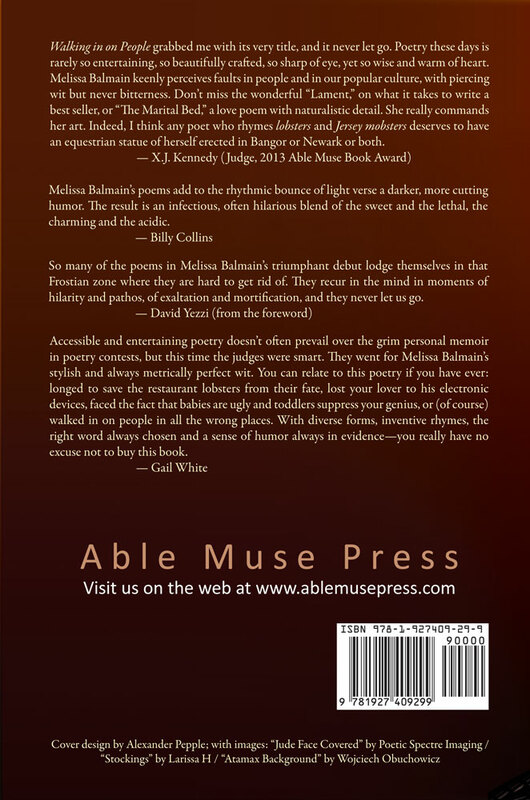 So many of the poems in Melissa Balmain’s triumphant debut lodge themselves in that Frostian zone where they are hard to get rid of. They recur in the mind in moments of hilarity and pathos, of exaltation and mortification, and they never let us go. Accessible and entertaining poetry doesn't often prevail over the grim personal memoir in poetry contests, but this time the judges were smart. They went for Melissa Balmain's stylish and always metrically perfect wit. You can relate to this poetry if you have ever: longed to save the restaurant lobsters from their fate, lost your lover to his electronic devices, faced the fact that babies are ugly and toddlers suppress your genius, or (of course) walked in on people in all the wrong places. With diverse forms, inventive rhymes, the right word always chosen and a sense of humor always in evidence—you really have no excuse not to buy this book. Melissa Balmain is a humorist, journalist, and teacher. She recently became editor of Light, the country's oldest journal of light verse, which she helped resurrect and bring online after 20 years in print. Balmain's poems have been published in such anthologies as The Iron Book of Humorous Verse and Killer Verse, and in American Arts Quarterly, Lighten Up Online, Measure, Mezzo Cammin, The Spectator (UK), The Washington Post, and elsewhere. Her prose has appeared in The New Yorker, The New York Times, McSweeney’s, Details, and many other magazines and newspapers. She is a columnist for Success magazine and the author of a memoir, Just Us: Adventures of a Mother and Daughter (Faber and Faber). Balmain has won national journalism honors and been a finalist for the Donald Justice Poetry Prize, the Howard Nemerov Sonnet Award, and the X.J. Kennedy Parody Award. She teaches at the University of Rochester and lives nearby with her husband and two children. 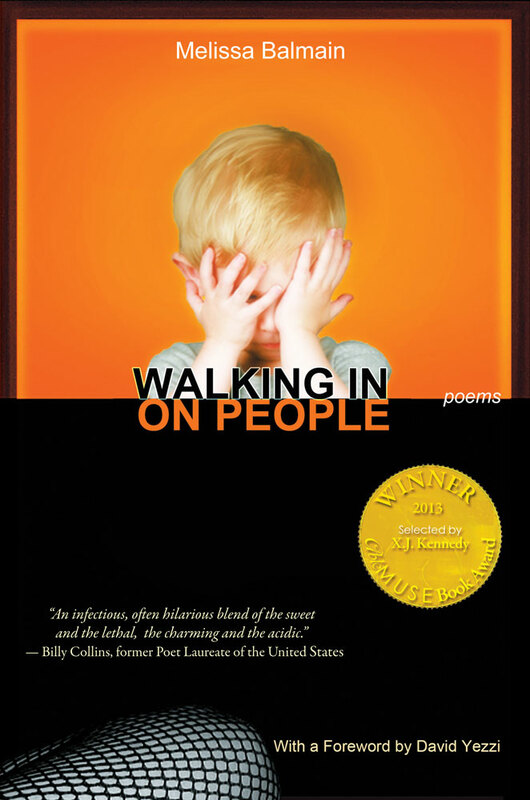 Walking in on People, the winner of the 2013 Able Muse Book Award, is her first full-length poetry collection.